In previous tutorials, we learned how to steal system tokens that we could use to access resources, how to use hashdump to pull password hashes from a local system, and how to grab password hashes from a local system and crack them. In each of these cases, the password hashes were the passwords of the users on the local system and not the domain. If the system is part of a domain (which is the case in most corporations and large institutions), they will likely have their password stored on the domain controller (DC). How would we get the domain passwords without attacking the fortified domain controller? One of the more powerful features built into Metasploit is the ability to set up a fake SMB server. This means that when someone on the network attempts to access the SMB server, their system will need to present their credentials in terms of their domain password hash. Very often, large networks have a system that systematically connects to each machine to check whether they are patched and secure. When it does so, it must present its credentials to each system and this will usually use the admin password. If we are patient, this may be the best strategy. In addition, by setting up this fake SMB server, we may be able to capture domain credentials as users attempt to authenticate against it. We could send the target an embedded UNC path, and when they click on it, we can grab their domain credentials. Unlike some of our other Metasploit attacks, this is neither an exploit or a payload. It is an auxiliary module, and is capable of capturing the hash in a format to be broken using either Cain and Abel or John the Ripper. Now that we have loaded this module, let's take a look at the options we need to set to use this module. As you can see, this module has numerous options, but we can leave the default settings on each of them, with the exception of the file type to store the hashes for cracking. Notice, I have highlighted the JOHNPWFILE option above. We also have the CAINPWFILE at the very top. These options allow us to determine the format of the file storing the hashes for cracking by Cain and Abel or John the Ripper. In this tutorial, I'll be using the latter tool. Now, all that is left to do is "exploit." 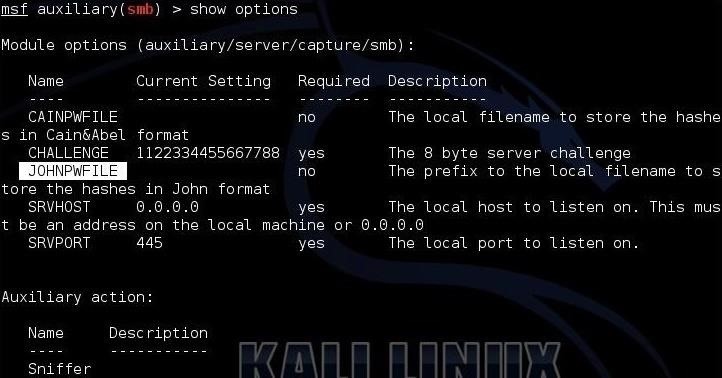 When we type "exploit," this module will start a fake SMB server that will store the presented credentials in the /root directory in files beginning with "johnhashes". When they click on that link, their domain credentials will be presented to our SMB server and captured as in the screenshot below. The final step is to crack the hashes to obtain the password. We need to go to the /root directory to find the saved hash files. When we do so, John the Ripper loads the password hash, recognizes the type of hash, and begins cracking it. Keep coming back, my neophyte hackers, as we explore the arts and techniques of hacking. 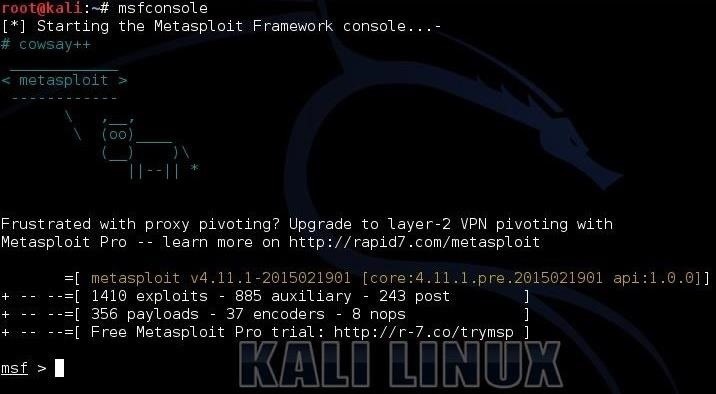 If you are new to Null Byte, make sure to go back to the other guides in this Metasploit Basics series, and check out all of the other hacking series we have! What does the net-command doing exactly? I also cant find the "use" option in the net help. To set up the server, shouldn't we have physical access to the network. I mean shouldn't the PC running metasploit be on the same network as the victims. Is there any way to set up a fake server after exploiting a system maybe using some meterpreter script or something like that? You are correct. You must be on the same network to use this "exploit". I don't believe there is a script to do this yet. I think it would be a good project for you. Shouldn't be too hard since you have this module to use as a template. Post it here when you are done. What does it do exactly.. I dont get it.. whats domain passwords?? What domain?? Which domain?? excuse me but what do you mean by "our share"? 1-Started SMB server as mentioned above. 2-Started a LLMNR response spoofer . (Set the IP of same attacker PC). 3-After some time LLMNR responder started to give answer to several queries. 4-I kept this setup running for 2-3 hours. LLMNR responder answered a lot of queries but nothing got captured at SMB server. Am I going in to right direction? Please let me know. can we use hydra to crack hash?